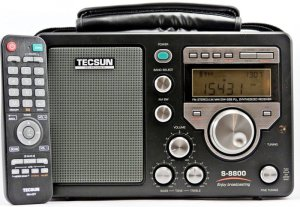 The long-awaited Tecsun S-8800 is now available! Equipped with analogue High-IF circuits, triple AM conversion and DSP decoding technology. This new radio receiver has excellent reception. Fitted with class-AB type power amplifiers and an ultra-dynamic full-range speaker, it creates a wonderful sound with excellent high/low tone selection. As a bonus, the supplied remote control provides the possibility to directly key in your favourite station frequency etc..